The Vashikaran experiment to bewitch any person or persons and dazzle and tantalize them into a powerful Vashikaran Spell, which has been described by me in this post is called as the Kele Dwara Vashikaran Prayog in the Hindi language. 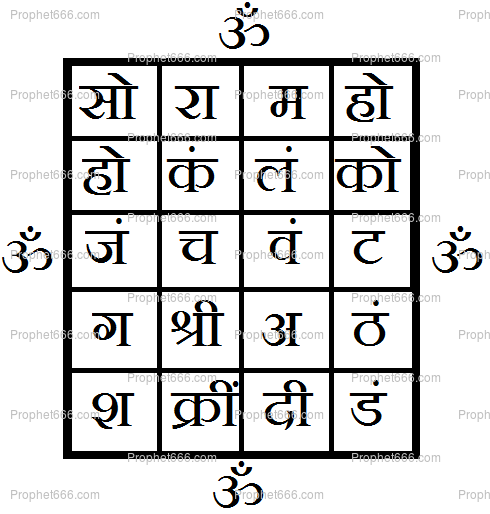 The simple method of performing this Vashikaran by Banana Yantra Experiment is given below. 1] Take a small portion of a ripe banana and crush it to make a smooth and consistent pulp. 2[Take a Bhojpatra and draw the Vashikaran Yantra on it using the Banana Pulp as the ink and a small pointed twig of the Jasmine Plant[Chameli Ka Ped] as the writing instrument. 3] Place the Vashikaran Yantra in-front of you and light an oil lamp and incense stick in-front of the Vashikaran Yantra. 4] Lastly, nicely fold the Vashikaran Yantra and insert it inside a Gold or Copper Locket and wear in on the body either around the neck or on the right upper arm, like a talisman. This Vashikaran Experiment is best suited for an un-ordained or a lay-person as there is no Mantra Chanting or Puja-Vidhi ritual involved. The Tantra says that wearing this Vashikaran Yantra on the body will make the Practitioner attractive and will make everyone spellbound and mesmerized by his or her personality. It is to be used as the ink and not as layers upon the Bhojpatra, so it will not decay or stink. Hello. It's hard to find bhojpatra where I live. Can I instead use plain white paper?